As a perfectionist, giving up on anything is near impossible for me. That’s like … quitting!!! Give me dead horse and I’ll beat that thing til it gets up and walks. Which is kind of a horrific expression for which I don’t even want to know the origin. So, maybe it’s more like beating my head against a wall. Yeah, much better. In the spirit of THAT much nicer image, I figure it’s gotta feel a whole heck of a lot better once I stop. A friend recently sent me this great article in the Huffington Post called 7 Things I Refuse to Stress About. I think that part of refusing to stress about something is giving up on the expectation of that thing. Or, giving up the expectation of me being something I’m just not! I am not a morning person. Well, to be exact, I am not a “jump out of bed and hit the day running” kind of person. I need time to ease into the day. A cup of coffee, lying in bed for a bit, browsing social media for news, tidbits and a check in on the world I’m about to head out into. I figure being asleep is the equivalent of dispersing my entity into the Unconscious for awhile. In the morning, I need some time to piece myself back together. To assemble my parts into a recognizable whole again and set my intent for the day. I used to carpool with a morning person and it was always the gentle tug-of-war. How about 6:30am? How about 6:45am? How about 6:35am and a stop for coffee along the way? When my carpool ended, I just decided to give up on the “early to work” industrious person that I kept expecting myself to be. Now, I sleep longer, wake with the sun and get to work by 9am. No one cares as long as my work gets done. I stay longer in the afternoon ’cause I don’t need to be home for kids or a family dinner. The rest of the office is gone by 4pm. And then it’s quiet and I have as much time as I need for all the productivity that my day requires. Dr. Seuss said, “Why fit in when you were born to stand out?” I know we all need that sense of tribe and a connectedness to other people. But, for years I always felt like I just didn’t quite fit in. I didn’t dress right, eat right, listen to the right music, watch the right TV shows, want to buy the right things. Once I gave up on trying to figure all that out, it’s amazing how much less stressful things got. I still probably don’t do all those things right, I just don’t really care any more. I have kind of a corporate career. But I’ve never been comfortable in corporate women’s clothing. The pantsuits and pinstripe tops. Pencil skirts that end just below the knee. The blouses with that weird kind-of-bow, kind-of-tie thing that drags in your food. I look at women CEOs and I think, “I could probably pull off that job but I’d never be able pull off the wardrobe!”. In an effort to figure out what I was doing wrong, I hired an image consultant who immediately started extolling my curves and encouraged me to dress for the “abundant” shape I have. Once I got over the trauma of that experience and followed her guidelines, I actually found that dressing for work isn’t as much of an ordeal as it used to be. Turns out curvy bodies turn stripes into, well, curves! I’m a lot more comfortable with my clothes now. And, hopefully there is room at the top for an abundantly curvy CEO with fun shoes. I grew up in a household where dinner was a meat portion, a vegetable portion and a potato portion. Occasionally, there was lasagna or spaghetti but there were always dinner foods at dinner. As a single person, I cook dinner for one. Well, okay, when I don’t eat out, I cook dinner for one. And a meat portion, a vegetable portion and a potato portion is a lot of effort for one person. And before I get inundated with “30 minute recipes for the single person” I’ll just tell you right now that I hate cooking. And everything to do with planning to cook. But, I do love breakfast foods. So I’ve given up on dinner food at dinner. I have eggs and bacon or a bagel with pb+j. When I do have veggies I don’t cook them cause I prefer them raw and it’s less work. Who defined breakfast food as breakfast and dinner food as dinner anyway! I’m recategorizing. I have curly hair. Those of you who also have curly hair will understand that curly hair has a personality of its very own. An unpredictable personality that changes with the weather. Literally. It has good days and bad days. It has fun days full of bounce and grumpy days where it pouts into a limp mess. But mostly, it needs a little oil to grease the wheels. I’m sure it was the clever shampoo advertisers who convinced us that we had to wash our hair every day (lather, rinse, repeat). 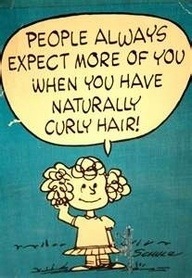 Not true for my curly hair. My hair looks best on about day 3. Before you get too grossed out, be assured that I wash my body almost every day. Just not my hair. I’ve given in to the ringlet-leader. I think I kind of understood the food pyramid when I was a kid. Since then, it’s been all downhill. Good fats, bad fats, leafy veggies, starchy veggies, whole grains, low fat, high protein, no gluten, protein shakes with flax oil, Atkins, South Beach, paleo, blood type, wheat belly … I officially throw in the tea towel. Trying to follow these conversations, let alone figure out what is all means is stressing me out. And as someone with food issues, the very last thing I need is for my food to take up any more space or energy in my day. So, here’s my nutrition plan. Eat when I’m hungry. Don’t eat when I’m not hungry. Make sure what I’m feeling is hunger and not some emotion like fear, loneliness, joy or boredom. Eat food that is closest to it’s natural state and that doesn’t have too many ingredients I don’t understand. Buy local and organic, if I can. Try to drink lots of water. And, when I screw up any of the above (which I do), don’t freak out and find inventive ways to punish myself. Be gentle and just keep trying. That’s it. I have tried to like olives. I really have. A few years ago, I went on a vacation to Greece and I was determined to learn to like olives so I could enjoy them in their native land. I followed that saying, “you have to eat seven olives before you like them”. Nope. I tried different kinds. Nope. Stuffed with feta. Nope. In a martini. Nope. In seven martinis! Nope. I do not like olives. I do not like them in my bread, I do not like them as a spread. I do not like them on a slice, I do not like them in my life. So, if you’re looking for someone who gets up early, washes her hair and has a nutritious breakfast that includes olives, I am clearly not your girl. But, if you’re looking for an imperfect curly haired quitter who has pancakes for dinner, I’m here. Giving up one day at a time. This entry was posted in change, perfectionism, self by WendyA. Bookmark the permalink. great post as usual. I can so relate to the corporate uniform one, I know I really should to dress to job position but try as I may I just can not do, I figure they have too much invested in me now to fire me over that and so I have really embraced my own style. I can’t remember the last time I wore a suit to work. I so don’t wash my hair every day, I am lucky if i get to it once a week, but I have to say, I love olives. I buy them by the half gallon jar even. Keep writing the great posts. Thanks, Kira! We do get judged by our clothes, I think. So, I’d rather have my clothes reflect who I am!! Thanks for the support! Wendy, you have become one of my heroes. Don’t worry, there’s no pedestal involved. I love your posts – your sharing, your courage, your transparency, and your realness. I love that you take the words right out of my mouth, and help me feel less isolated in my experiences. I almost said ‘normalize’ my experiences…. but I’ve come to believe that normal is not actual something I aspire to (not that it was ever an option). Thank you! Wow, Shosh. Thank you SO much. What a wonderful comment to wake up to this morning. Support like this keeps me venturing into the scary areas, even if my legs get wobbly. Big hug.